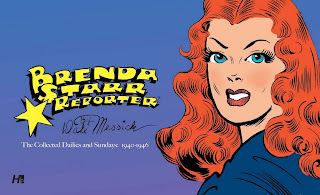 I got a chance to look at an advance preview of Brenda Starr, Reporter: The Collected Daily and Sunday Strips: Volume One from Hermes Press, due out in January. It reprints the first years of Dale Messick's famous newspaper strip, covering 1940 through 1946. Which sounds like am almost unwieldy amount for one book, but the strip only ran on Sundays until late 1945, before it finally went daily. I was interested to read these because my only familiarity with Brenda Starr comes from the strips after Messick retired in 1982. I was curious what Messick herself had done, especially in lieu of her position as one of the pioneering female cartoonists in what is still a male-dominated industry. There are several note-worthy things about this collection. First, because it covers a substantial period, readers are easily able to see Messick's art evolve. The earliest strips aren't bad, but they definitely improve as things move forward. Not only do Messick's illustration skills get smoother, but she also gets noticeably better with her storytelling and pacing. Second, Hermes has included several extras that shed some more light on Messick herself. 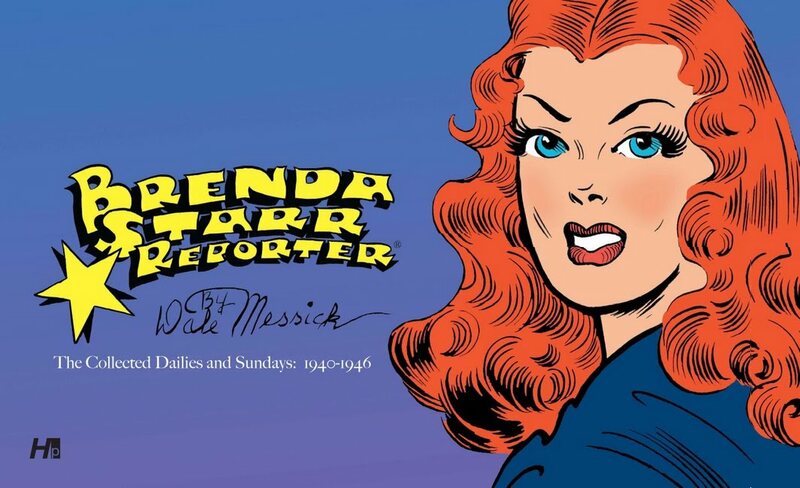 There are pieces by Messick's daughter and grand-daugher, one by cartoonist Richard Pietrzyk and another by comic creator and historian Trina Robbins. Robbins' is, not surprisingly, the most fact-filled and provides the broadest look at Messick's entire career. The familial pieces, more focused on impressions and a few anecdotes, speak more to Messick's character. Combined, they all paint a rounded picture of her, despite being a very minor part of the overall book. Third, Hermes includes some annotated process pages, showing not only Messick's creation process -- with layout sketches, scans of original art and color guides -- but also some references to the digital clean-up work they did for producing the book. This latter portion is a decidedly small part of the book but quite useful, I think, in reminding some readers that more work goes into these reprint productions than simply scanning the pages in. None of these process pages gets overly technical, but enough to educate the completely uninformed as well as provide a guide that those already knowledgeable about the process generally can figure out what Messick was doing more specifically. If you have any interest in Messick, Brenda Starr or newspaper strips, I think this looks to be a handsome and useful volume to add to your collection. I haven't seen many other reprints of these strips before, but Hermes has done a far superior job to ensuring these strips look/read well than any of Brenda Starr reprints I've seen previously.Brenda Starr, Reporter: The Collected Daily and Sunday Strips: Volume One is due out in January 2012.